History, political philosophy, and constitutional law were born in Athens in the space of a single generation--the generation that lived through the Peloponnesian War (431-404 b.c.e.). This remarkable age produced such luminaries as Socrates, Herodotus, Thucydides, Sophocles, Euripides, Aristophanes, and the sophists, and set the stage for the education and early careers of Plato and Xenophon, among others. The School of History provides the fullest and most detailed intellectual and political history available of Athens during the late fifth century b.c.e., as it examines the background, the context, and the decisive events shaping this society in the throes of war. This expansive, readable narrative ultimately leads to a new understanding of Athenian democratic culture, showing why and how it yielded such extraordinary intellectual productivity. As both a source and a subject, Thucydides' history of the Peloponnesian War is the central text around which the narrative and thematic issues of the book revolve. Munn re-evaluates the formation of the Greek historiographical tradition itself as he identifies the conditions that prompted Thucydides to write--specifically the historian's desire to guide the Athenian democracy as it struggled to comprehend its future. The School of History fully encompasses recent scholarship in history, literature, and archaeology. 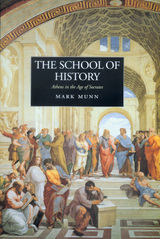 Munn's impressive mastery of the huge number of sources and publications informs his substantial contributions to our understanding of this democracy transformed by war. Immersing us fully in the intellectual foment of Athenian society, The School of History traces the history of Athens at the peak of its influence, both as a political and military power in its own time and as a source of intellectual inspiration for the centuries to come. Mark Munn is Associate Professor in the Departments of History and Classics and Ancient Mediterranean Studies at the Pennsylvania State University and the author of The Defense of Attica: The Dema Wall and the Boiotian War of 378-375 b.c. (California, 1993).